The IPT is an initiative of the International Coalition for Human Rights in the Philippines, the International Association of Democratic Lawyers, the National Lawyers’ Guild and IBON International with the purpose of probing rights violations in the Aquino administration. The Prosecution presented before the Jurors a total of 34 cases with 32 witnesses. Lead prosecutor was Ramsey Clark, an American lawyer, activist and former federal government official who occupied senior positions in the US Department of Justice. Among the cases heard by the IPT were the cases of Mary Jane Veloso and the more than 300 Filipino teachers who were trafficked to the US. Maritess Veloso, Mary Jane’s sister, and Loel Naparato, one of the 300 teachers, acted as witnesses for the prosecution. “We welcome the verdict from the IPT. We have long asserted that the Aquino administration’s labor export policy highlights the worsening violations of the rights of Filipino migrants. Filipinos are being forced to migrate because of desperation borne out of the economy’s lack of development resulting in job loss, low wages and lack of livelihood at home. OFWs have borne witness to how insincere, insensitive and inept the Aquino government is in upholding and securing the protection and welfare of OFWs. 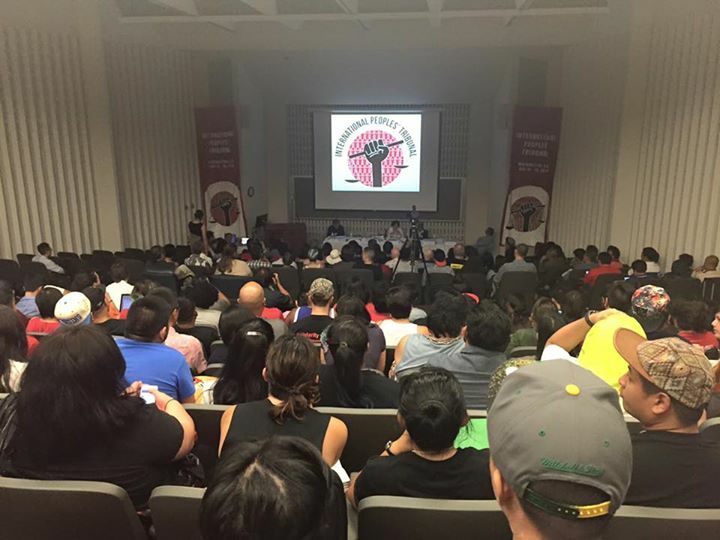 Instead, what it showcased in the last five years was a more blatant and unapologetic labor export policy that continues to exploit OFWs’ cheap labor and foreign remittances in accordance to US imperialist interests and dictates,” said Sol Pillas, Migrante International secretary-general.